The leaves are light-green, narrow, with almost parallel sides, and diamond-shaped. The undersides are covered with white powder. The flowers are green, tiny, without petals, and located at the tip of the branches. The flowers' undersides are also covered with white powder. Each plant can produce up to 75,000 seeds. This weed is easily mistaken as pigweed and vice-versa. Lambsquarter is an alternate host to beet leafhoppers that transmit viruses. The leaves are eaten as vegetable and the seeds are a good source of protein when prepared as hot cereals or baked goods. 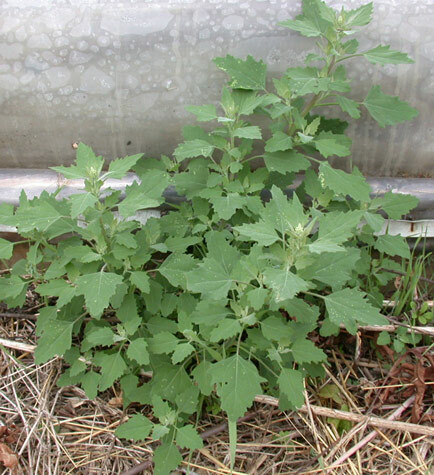 Studies show that Lambsquarters are found to be resistant to Atrazine, Metribuzin, Thifensulfuron-methyl, Simazine, Cyanazine at some corn, soybean, and potato farms, croplands, and orchards in some parts of Europe and USA (Weed Science, 2005). Proper weed management. The weed is easy to pull as it is shallow rooted. Bingaman, B.; Christians, N. (1995): Greenhouse screening of corn gluten meal as a natural control product for broadleaf and grass weeds. Hortscience 30 (6): pp. 1256-1259. Christians, N. (1999): Spectrum of weed control by the natural herbicide corn gluten meal (CGM). Strawberry IPM Update. Vol. 4(1): pp. 4-5. Webber, C. III; et. al. (2005): Vinegar as an organic burn-down herbicide. Proceedings of the 24th annual horticulture industries show. pp: 168-172. Webber, C. III; Shrefler, J. (2005): Corn gluten meal application methods for weed control. Proceedings of the 24th Annual Horticulture Industries Show. pp. 163-167.